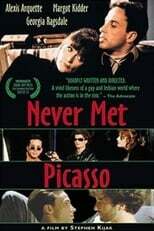 This gay-oriented drama centers on the life and exploits of Andrew, an aspiring painter. Still living at home with his mother Genna, an avant garde actress, constantly rejected by art schools, and without a lover, Andrew decides to enter a contest in hopes of winning a six month stay in Kenya. Though things aren't great for Andrew, neither are they wonderful for his lesbian friend Lucy who constantly bickers with her lover Ingrid. Lucy complicates Andrew's life when she introduces him to the suspicious-looking, enigmatic Jerry.